A single paved road divides the Big Wild: US 12. Officially designated the Northwest Passage Scenic Byway, it stretches from Lewiston, Idaho to Lolo Pass and the Idaho-Montana state-line. For approximately 170-miles the narrow, two-lane highway cuts through the Nez Perce Reservation, accompanies the entire length of the Clearwater River, and hugs the picturesque Lochsa River. In 1968, Congress designated both the Middle Fork Clearwater and the Lochsa Rivers as wild & scenic waterways, with a goal of preserving the rivers and “their immediate environments” for present and future generations. In 2009, unbeknownst to citizens, Idaho Governor C.L. “Butch” Otter and state Congressmen signed a “letter of support and cooperation” for multi-national corporations to transport their road-blocking equipment up US 12 and through the scenic corridor. The transports soon became known as “megaloads”. In 2010, the first of those megaloads arrived by barge at the Port of Lewiston. With an agreement in place, Emmert International was issued permits by the Idaho Transportation Department (ITD) to transport four ConocoPhillips modules up the highway. The approximate dimensions for each were 500,000lbs. x 220ft. long x 28.ft tall x 22ft. wide. The width of US 12 is approximately 24-feet. A typical logging truck weighs 80,000lbs. Citizen outrage resulted in attorneys from Advocates for the West filing a lawsuit in state district court, and successfully arguing that ITD was negligent for issuing the permits. On appeal, however, the Idaho Supreme Court ruled that the courts, at this time, do not have jurisdiction over the merits of the case, and that administrative processes must first be exhausted. This resulted in a contested case hearing, which is an administrative process where citizens present testimony to a hearing officer (a retired judge in this case) and request those permits be denied. But the ITD was authorized to handpick the hearing officer! Not surprisingly, public concerns were squashed and Emmert International dragged their equipment up the highway in the dead of winter. In 2011, Exxon/Imperial Oil barged dozens of megaloads to the Port of Lewiston. After a few informational meetings, at which the majority of the public voiced opposition, the ITD issued permits to the equipment hauler, Mammoet. Their job was to transport the equipment up US 12, over Lolo Pass, through Montana, and eventually to the Alberta Tar Sands. As a result of the Idaho Supreme Court ruling the previous year, however, members of the public were entitled to a separate contested case hearing if they believed that the ITD was wrong in issuing permits. Advocates for the West, on behalf of a dozen citizens, filed and received such a hearing. And as expected, the public lost. Justice prevailed in Montana, though. Attorneys for conservation groups and the Missoula County Commissioners successfully argued in district court that the Montana Department of Transportation approved a faulty environmental assessment when issuing permits for Mammoet. The judge placed a permanent injunction against any Imperial Oil megaloads traversing the Montana portion of US 12 that were destined for the Kearl Oil Sands. Exxon and Mammoet were forced to choose an alternative route—one that doesn’t cut through the heart of the Big Wild! In February 2013, Advocates for the West, on behalf of Idaho Rivers United (the Nez Perce Tribe filed an amicus brief, too), successfully argued before a federal judge that the US Forest Service does indeed have the authority to regulate megaloads on US 12, and that the agency acted “unlawfully” when determining that they lacked the authority to do so. For the first time in 3-years folks breathed a sigh of relief–sort of. Some time during the summer of 2013, conservationists learned about a proposal concerning heavy-haul specialist’s Omega Morgan inquiry to transport 8-10 megaloads across Highway 12 over the coming months. Similar to Exxon/Imperial Oil, these loads were also destined for the Alberta Tar Sands. Engineering drawings showed the first two modules to be 644,000lbs., 255-feet long, 21-feet wide and 24-feet tall. 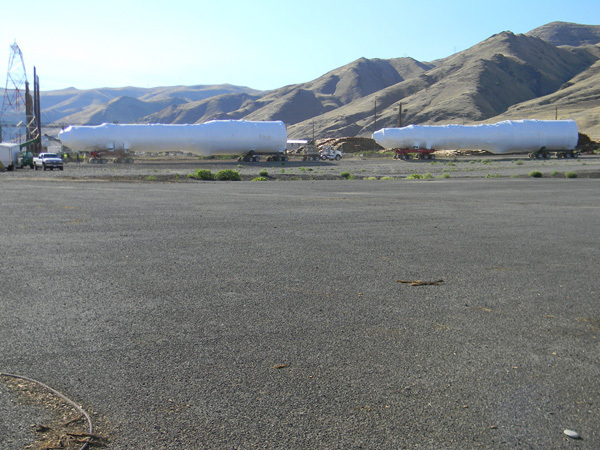 In August, two waste-water evaporators manufactured by General Electric were barged to the Port of Wilma in Washington, where they waited to receive permits from the Idaho Transportation Department. 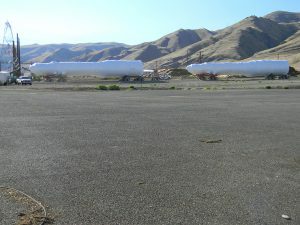 Within days, the Nez Perce Tribe issued a resolution opposing the shipments to go through their land, having yet to be consulted by the federal government. 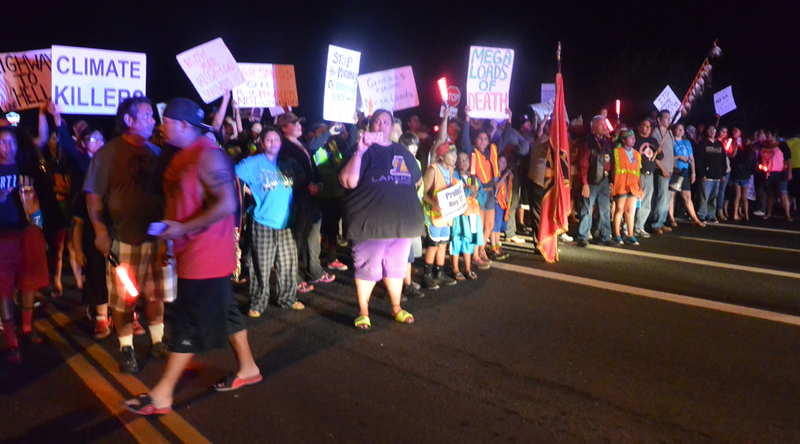 Nonetheless, the state of Idaho still issued a permit on Monday August 5 for the first megaload to enter the highway. That night, approximately 150-members of the Nez Perce Tribe blockaded Highway 12 at the reservation boundary, leading to the arrests of many individuals, including 8-members of the Nez Perce Tribal Executive Committee. On the following two nights, as the megaload advanced up the highway, members of the Nez Perce Tribe successfully blockaded the road, leading to even more arrests. In three-nights total, approximately 30-members of the Nez Perce Tribe were arrested for defending their sovereign nation status. By the end of the week, the Nez Perce Tribe and Idaho Rivers United filed a lawsuit in federal court–the Omega Morgan megaload had made it into Montana, but there was still a second one at the Port of Wilma. On September 13, 2013 Federal Judge B. Lynn Winmill ruled in favor of the plaintiffs and granted a temporary injunction against the future transport of Omega Morgan megaloads on US 12. 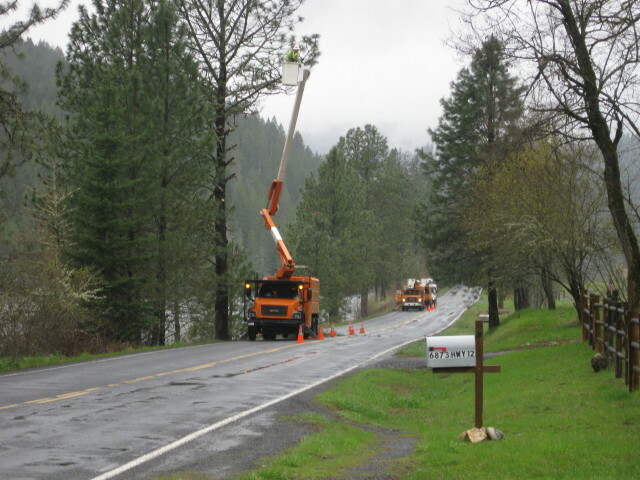 In a 17-page decision, the judge ruled that the Forest Service must issue a highway Closure Order for mile-marker 74-174, in the event that the state of Idaho issues another permit for an Omega Morgan megaload. This order is to remain in effect until the Forest Service completes its corridor study, followed by the completion of its consultation obligation with the Nez Perce Tribe. A coalition of groups from around the region, including Friends of the Clearwater, have played a big role in preventing Highway 12 from becoming a permanent industrial corridor. All of them are to be congratulated. Below are some of the groups.